It’s that time of the month again — our giveaway time! As daylight gets harder and harder to see, we wanted to give something a little different. 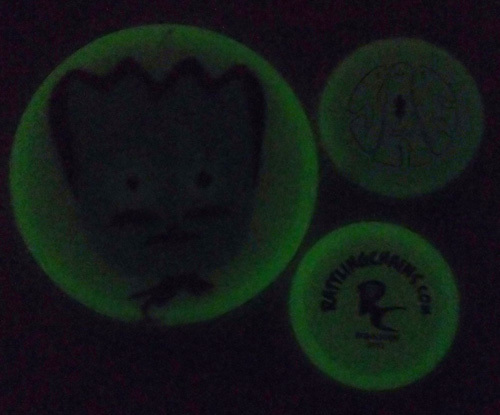 So how about some glow plastic? First, though, allow us to announce the last winner — of the MVP plastic. The winner of the MVP prize pack was Tricia Lafferty, whose Facebook entry earned her the pack! Congrats, Tricia! An e-mail has been sent. Please get us the needed info within a week, or we’ll have to re-draw for another winner! And now, back to the task at hand. This month, we’re handing out some glow plastic. 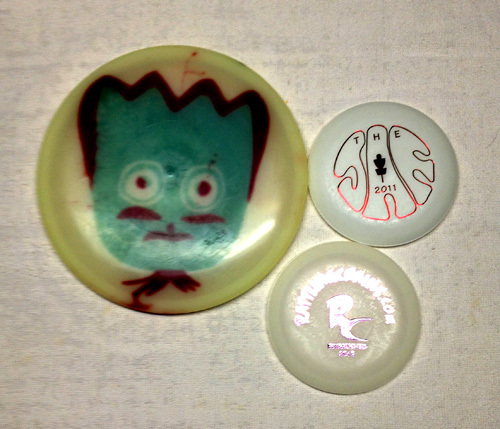 That includes an Innova Aviar (big-bead), with some custom art by Rattling Chains crew member Darren Dolezel. We also have two glow minis — a Rattling Chains one and one from the 2011 New Jersey Jam, donated by professional Bob Graham. I don’t have the weight on the Aviar, but if I remember right, it’s about 172. The winner will be chosen at random by RaffleCopter at the end of the giveaway. How it works: To gain entries, you have to do the items below. The first is mandatory — a comment on the blog — and you have to answer a question, which you can see when you click on that option. PLEASE answer that question as last time some people didn’t do so. We do this to make it fun and interactive. OK, folks, it’s time to give away some more plastic. And we have a couple of nice discs to give you this time, but before we get to that, let’s clean up our last giveaway. 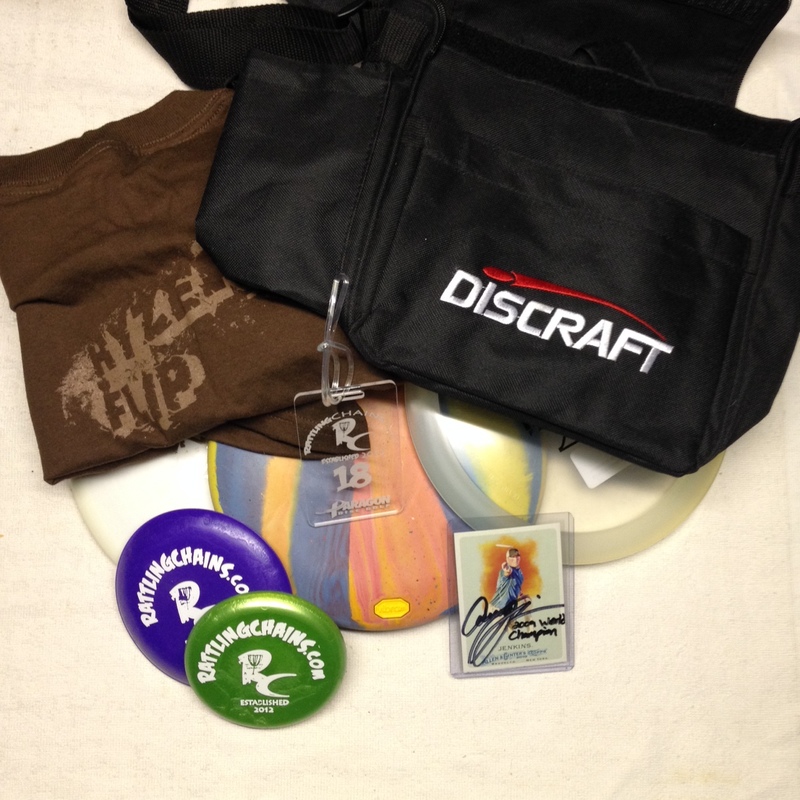 The winner of that awesome Rattling Chains prize pack was Erik J. Barzeski, whose twitter entry earned him the pack! Congrats, Erik. An e-mail will be sent and please get us the needed info within a few days, or we’ll have to re-draw for another winner! 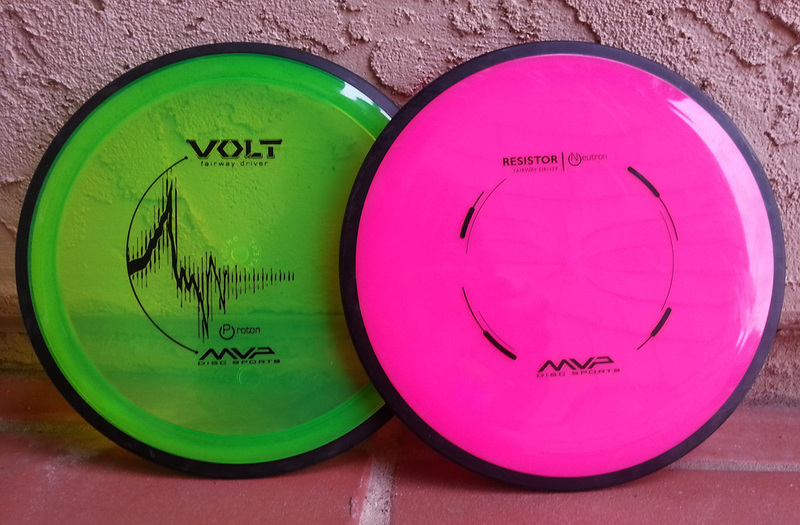 We have two MVP discs, slightly used by Rattling Chains staffer Steve Hill for review purposes. Outside of that, they are slick and ready to add to your bag! So, hook it up and enter to win! 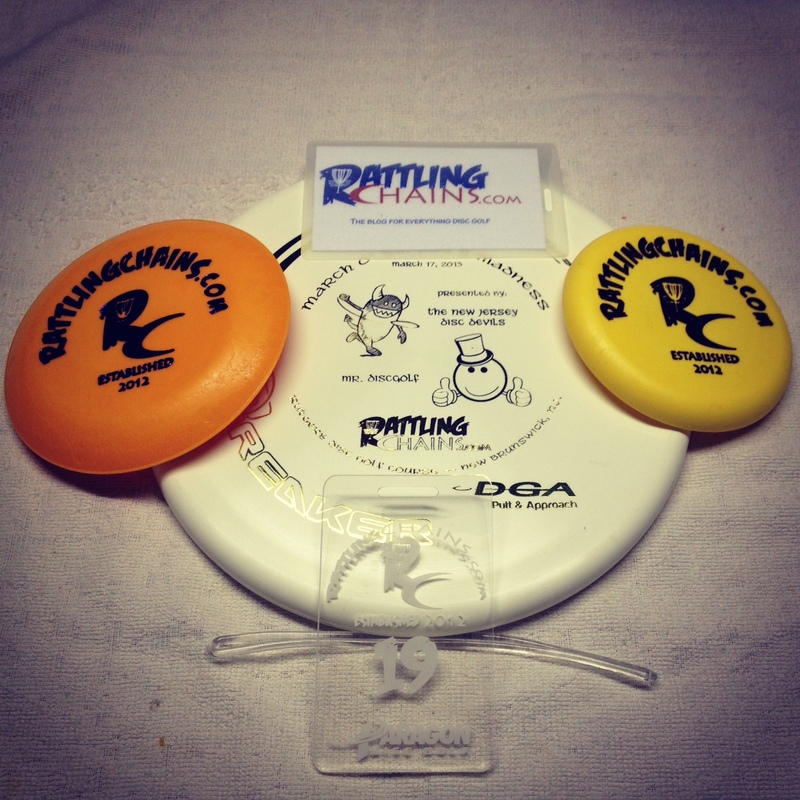 Win a Rattling Chains disc golf pack! We have some cool things we have lined up to give away on the site, so this will be the first of many more. We hope to do this on a somewhat semi-regular basis. Have a chance to win this packet of goods! We’re switching how we do things a little with giveaways, though, as we’re going with the RaffleCopter widget below. It helps us verify that entries are being done correctly, which is what we needed. It also helps us with a random winner based on the entries. Here’s the best, too — it allows many ways to get extra entries to this giveaway. I’ll get into how the widget works in a moment, but let me tell you what we’re giving away, first. A DGA Breaker from the tournament we co-sponsored this past March. Two (2) Rattling Chains minis, made by Zing Minis. One is an Aerofoil, the other is a minifoil. A Rattling Chains bag tag. Only 20 were made (numbered 1-20) and only a few remain. A Rattling Chains weatherproof/reusable scorecard. How it works: To gain entries, you have to do the items below. The first is mandatory — a comment on the blog — and you have to answer a question, which you can see when you click on that option. I hope everyone had a great day yesterday and that the holidays are treating everybody well. … such as a major giveaway! Since before we officially launched this blog, we’ve had many people donate stuff to be used for giveaways. Therefore, the pile is growing. With that in mind, I thought it would be good to make some packages up and have a giveaway where we’d give more than one thing away. There are three groups of items we are going to be giving away. For each, there are specific things you need to do. If you don’t do exactly what is required, your entry will not count without notification. Any entries that require you to post comments below need to be separate. In other words, if you are entering two of the contests and they each require a comment, you need to comment twice and do it as required. So make sure you read this fully before just entering or your entry might not count! Also, though you can (and I would encourage you to do so) enter each contest, you can win only one. It would be smart to enter each, though, giving yourself better odds to win something! Read on to see what you have to do to enter each contest.